The cephalosporins contain a basic β-lactam structure fused to a six-membered ring. Drugs in this class differ widely in their spectrum of activity, susceptibility to β-lactamases produced by bacteria, and serum half-life. 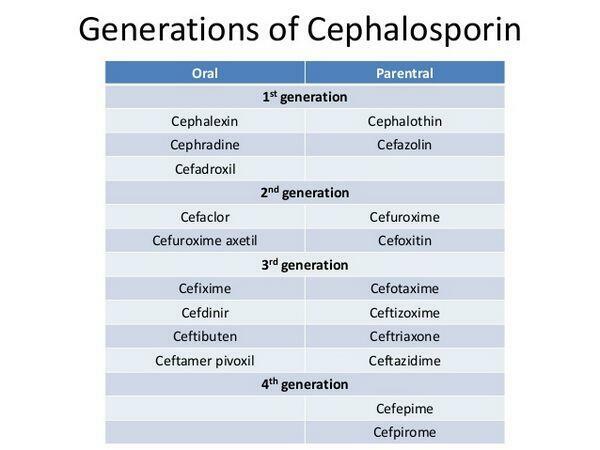 Cephalosporins are categorized into four generations, with each newer generation representing an improvement in the spectrum of bacterial coverage. The most important agents in this class are the second- and third-generation agents, which are commonly used in hospitalized patients in combination with a macrolide. One of the limitations of the cephalosporins is lack of activity against the atypical pathogens, such as Chlamydia pneumoniae and Mycoplasma pneumoniae. First-generation cephalosporins have the narrowest spectrum of activity and are most active against staphylococci and streptococci. Most first-generation cephalosporins are oral formulations. For community-acquired pneumonia, use of first-generation cephalosporins is limited to treatment of mild episodes, usually in patients with a history of delayed-reaction penicillin hypersensitivity (increased sensitivity to penicillin that does not appear until 24-48 hours after exposure), or cases where the identity of the infecting pathogen is known. Second-generation agents have increased activity to cover more gram-negative bacilli, but they are usually less active than the first-generation drugs against gram-positive bacteria. The oral second-generation cephalosporins are used empirically to treat mild episodes of community-acquired pneumonia. Comparable in activity to the oral second-generation cephalosporins, the parenteral second-generation cephalosporins are typically prescribed for patients who are unresponsive to first-line therapies or unable to take oral formulations. Third-generation cephalosporins are active against gram-negative organisms, but their activity against gram-positive organisms is inferior to that of previous generations. These agents are the cephalosporins most commonly recommended in clinical guidelines for first-line treatment of patients hospitalized with community-acquired pneumonia. Compared with second-generation cephalosporins, the third-generation agents are more potent against gram-negative bacteria, have greater stability against β-lactamases, and have longer serum half-lives. As a result, they have more convenient dosing regimens. The third-generation agents may also be used in combination with extended-spectrum penicillins or aminoglycosides to treat severe community-acquired pneumonia. Fourth-generation agents have enhanced stability against β-lactamases and provide good coverage of both gram-positive and gram-negative bacteria. Fourth-generation cephalosporins have pharmacokinetic properties similar to those of the third-generation cephalosporins. They are reserved for severe infections such as sepsis given their efficacy against problem pathogens such as Pseudomonas species. 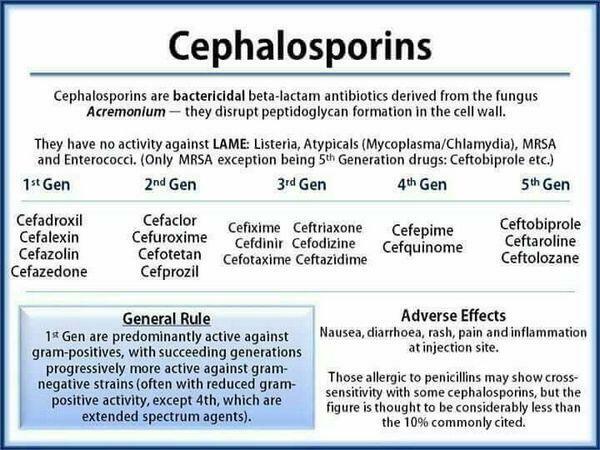 As a class, the cephalosporins are generally well tolerated. Common adverse effects are usually minor; gastrointestinal disturbances and thrombophlebitis (with IV agents) are the most prominent. Disturbances of the gastrointestinal tract are reported less often with cephalosporins than with the penicillins. Cephalosporins have declined in use for outpatient community-acquired pneumonia as a result of their poor activity against atypical organisms and the rise of the macrolides and fluoroquinolones. However, second- and third-generation cephalosporins have an important role in treatment of hospitalized patients. β-lactamase-producing bacteria. Resistance to third-generation cephalosporins in gram-negative pathogens is a formidable problem in the hospital setting and is associated with adverse clinical outcomes and increased hospital costs. Cephalosporins, like the penicillins, bind to PBPs in bacteria and prevent bacterial cell-wall formation. By interrupting cell-wall formation, cephalosporins induce cell lysis and death. The cephalosporins contain a β-lactam ring that interacts with the PBPs.